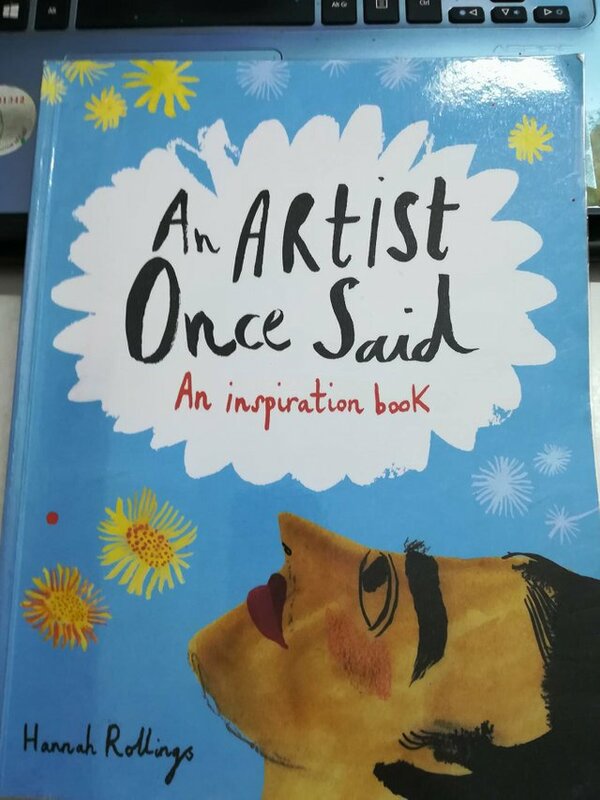 One of my favorite art journal book is An Artist Once Said – An Inspiration Book. I bought it as a gift for myself a couple of years ago but I never use it until very recently. 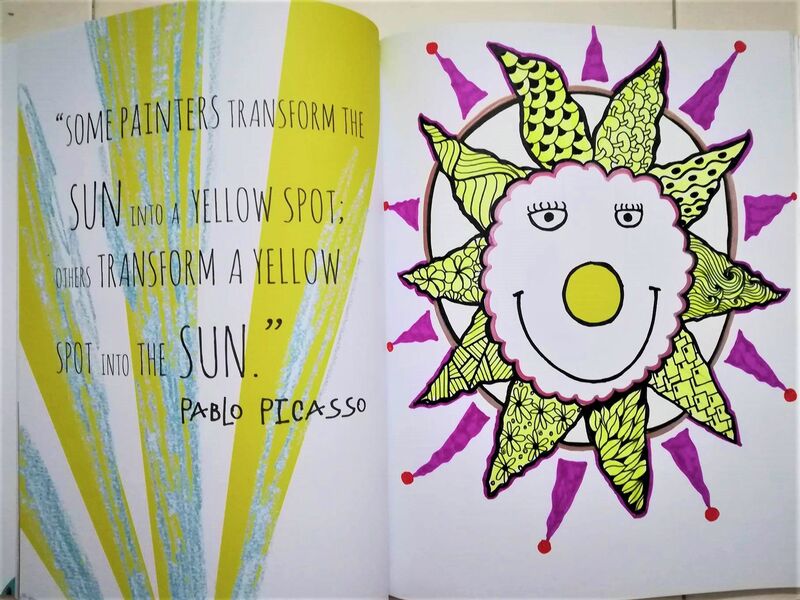 This book is a journal that contains 50 thought-provoking quotes from famous artists like Warhol, Van Gogh, Pollock, Dali, and several others. 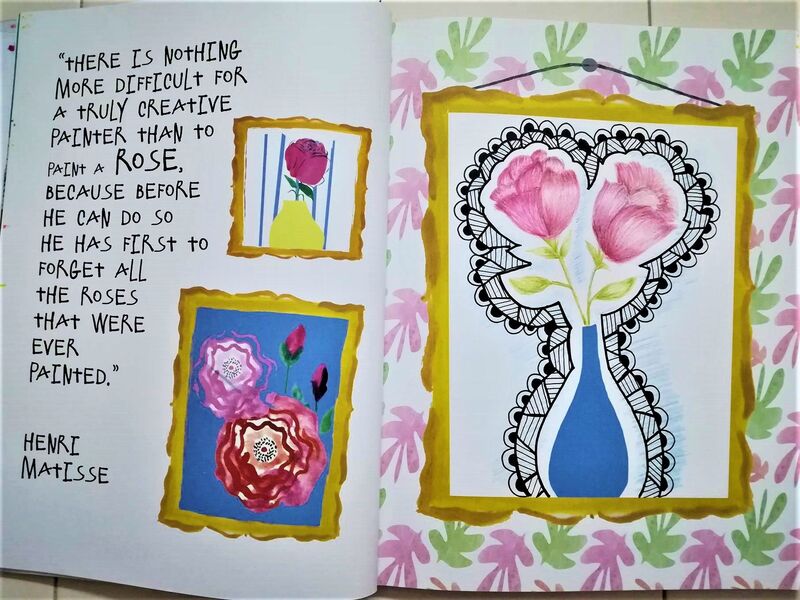 Each quote is beautifully illustrated by Hannah Rollings to inspire the reader to fill the rest of the blank space with his or her own art (art journaling). Here is the front cover of the book. I wrapped the cover because I am going to use this book quite heavily. And here is a short flip through video that I made. I love this book. I used it mainly to express myself when I have an “artist block” or when I feel uninspired. All I have to do is to go through the pages and choose a quote that inspires me. I can doodle, draw, color, paint anything that comes to my mind. Here are five pages from the book that I completed recently. All wannabe artists must imitate other artists before they can come out with their own original work in their own personal style. 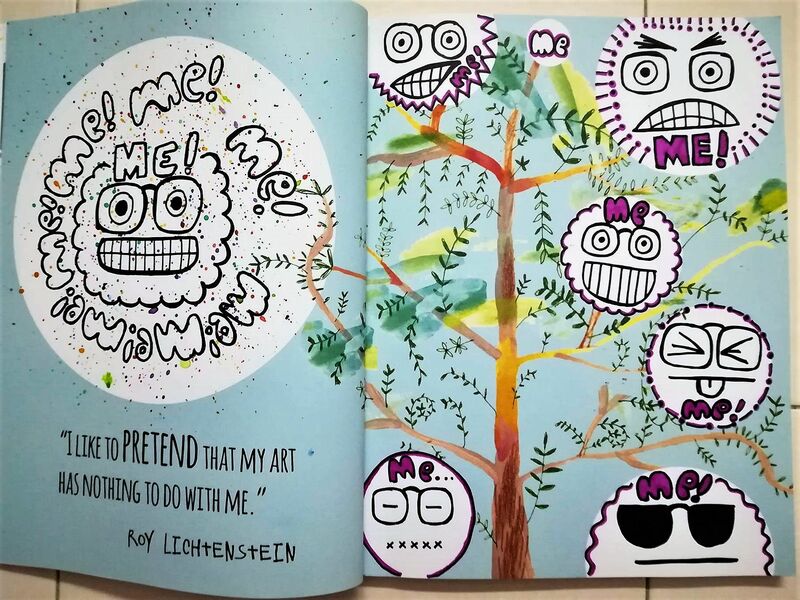 I tried all kinds of art style before I figured out what I truly good at – portraits, stencil art, and doodles. I don’t become good overnight. Some people attribute it to talent but I tend to disagree. All of that doesn’t come easy but it has always been interesting to me. Even when I couldn’t do it right, my interest in it keeps me going. I keep drawing portrait after portrait, one doodle to another, even as I have no tangible successes. And slowly I am improving. It’s a simple rule of life that if you practice, you will improve. 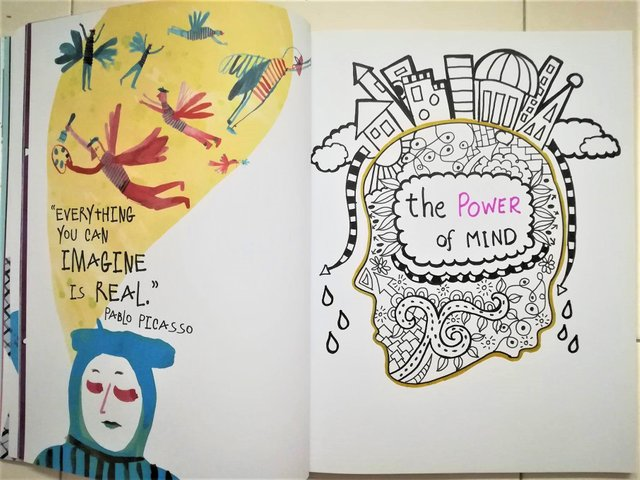 Creativity requires a lot of imagination. A very creative person sees ideas and inspirations wherever they go. They are often full of drive and they have lots of ideas to create something and this often becomes a problem to them because they get frustrated due to lack of time and other resources to execute all of their ideas. I often feel frustrated with the need to eat and toilet breaks when I am so engrossed in my work. I wish I could go on working without having to eat or ease myself. Sounds silly but I am very sure it’s a common complaint among creative people. I create for myself. Some people have the noble motive to create art to help other people. That is good but I honestly think it can’t last long because, at the heart of it, you want to please people more than pleasing yourself. I create my art mainly to figure myself out, to try to make sense of things that weigh heavily in my soul or to put certain obsessions to rest. Beauty is subjective. My beauty standard is different from yours. I think what I created are beautiful. I love them enough to share them with the world to be admired or criticized. It takes a lot of courage to do that because it’s a fair game out there. If people think they are wonderful, that is great! If they think what I created is awful – wrong choices of colors/too dark/too vibrant/too ugly – that is great too! I don’t know about other artists and I can only speak for myself. I learn to improvise because I often can’t afford good quality art supplies. I improvised by using whatever materials I have at hand. I don’t use my lack as an excuse not to express my perspective through creativity. This habit teaches me to be the best in whatever I do with whatever I have in all areas of my life. 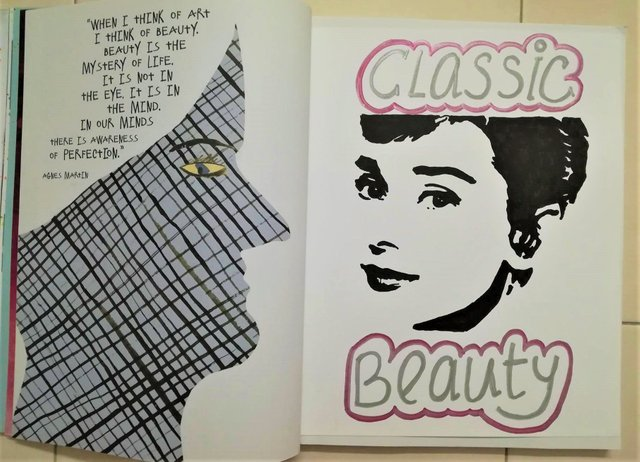 So there are the sneak peek to the five pages from my art journal book. I completed several others but so far these five are my favorite. There are many other art books I wish to share but I think it will take several blog posts to cover all of them. Perhaps I will write a post about some of them sometime soon.